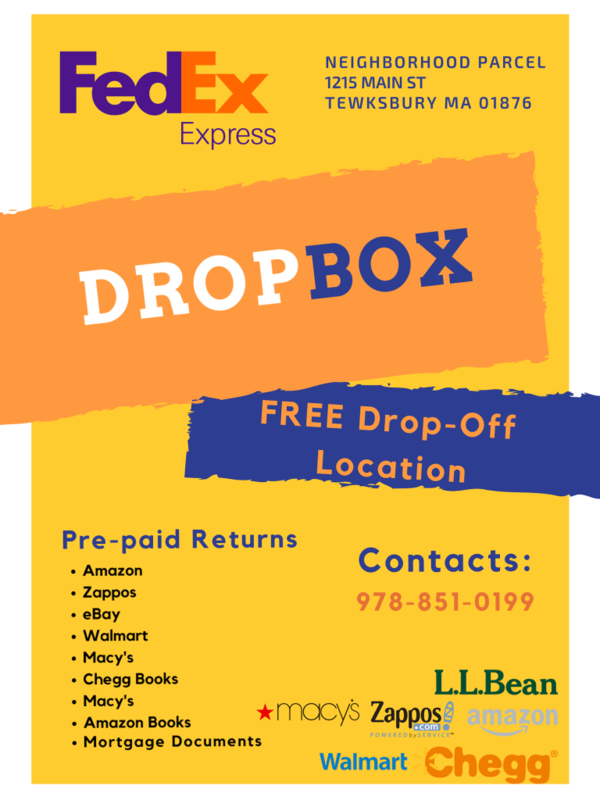 Free FedEx Dropbox location, conveniently located at 1215 Main St, Tewksbury, MA 01876. Can be used to drop-off all FedEx pre-paid shipments from Amazon, eBay, Walmart, Macy’s and LLbean. Neighborhood Parcel is your nearest FedEx Dropbox location for all your returns and shipping your pre-paid packages. The company is conveniently located at 1215 Main St, Tewksbury, MA 01876. If you are looking for a FedEx Dropbox location near you, then you should use the free drop-off service at Neighborhood Parcel. They can help you process your returns that normally won’t fit in the standard FedEx Dropbox and accept your FedEx Ground Returns. The service is limited to small to medium size boxes, all heavyweight shipments of 25Lbs or more or over 20″ long need to be dropped off at the nearest FedEx warehouse. Consider investing in these five shipping tools to avoid shipping mishaps and maximize both your small business’s profits and efficiency. If your small business ships products directly to customers, it’s important to optimize your processes in order to avoid wasting time, human resources and, ultimately, your money. A good shipping process involves more than just the right packaging material. This means finding and using Neighborhood Parcel shipping service solutions that organize and track your packages. Whether your business is small and you can track your details with a notebook, or you ship hundreds of packages a week, our POS system will help you record and track details of your customers and their orders. While buying products online is popular, home delivery isn’t always a customer’s first choice. Our POS system will help you scan FedEx rates and suggest the best option for your budget. We will email you a copy of your receipt along with the tracking information that you can share with your client, update PayPal or track the delivery of your package. We are not limited to FedEx brand, we will scan DHL, UPS and The Post Office Rates and have you select the best for your budget. “Where’s my package?” This is a question that strikes fear into the heart of many a small business owner and residents, but with the FedEx tracking tool, it shouldn’t. To save time organizing and keeping track of packages as well as the other financial aspects of your business, choose a shipping system with electronic billing. We can send you your annual statement showing how much you spent on shipping and packaging. Drop off pre-packaged and pre-labeled shipments. FedEx shipping labels are not available in store, you MUST print your own label, package your material correctly to be accepted for FedEx Network. Packages over 25 pounds or over 24″ are not allowed to be dropped off or picked up from Neighborhood Parcel of Tewksbury MA. We can not bill 3rd party account numbers. If you have FedEx account number, you MUST either print your own labels online or go to the nearest FedEx Office location. For package tracking and FedEx Customer Service go to www.fedex.com or call 1.800.GO.FEDEX. I used to go all the way to Wilmington to ship my FedEx packages and drop-off my pre-paid returns. I was so happy to find Neighborhood Parcel. It has a very convenient location, right off Route 38, free parking and they can help me package my shipments. Very friendly service and I am happy to recommend them. They are my favorite FedEx Dropbox location.